The range of outcomes is wide and includes the GOP holding on. This is a difficult article to write. Not for any deeply personal reason, but just because I’m not quite sure what I’m supposed to lead with — the most likely outcome or the uncertainty around that outcome. 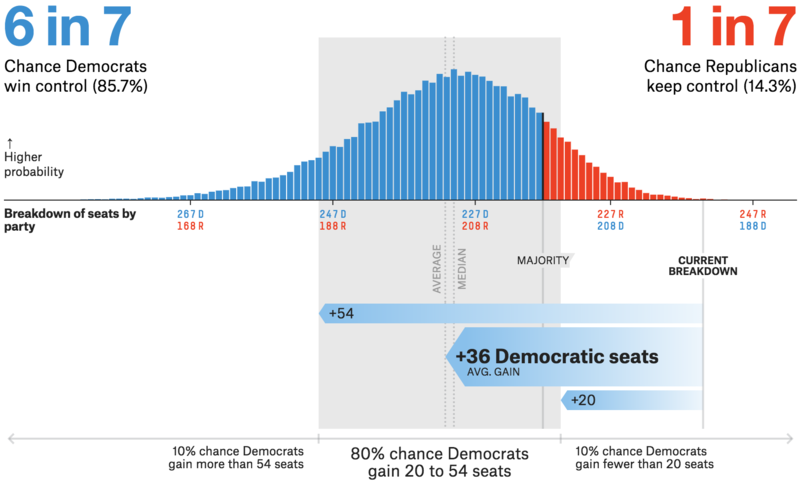 But an 86 percent chance (or around 6 in 7) — which is the chance that Democrats have of winning the House, give or take a bit in the various versions of the FiveThirtyEight forecast model — is nonetheless a pretty good chance. (Republican odds of keeping the Senate are also just north of 80 percent in a nice bit of symmetry.) To say that the range of plausible outcomes is broad and includes Republicans keeping the House does not mean that all such outcomes are equally likely — a point on which some people may be confused too. Here’s some perspective: An 86 percent chance is closer to Barack Obama’s odds of winning in 2012 than Hillary Clinton’s in 2016. The difference is basically this: Clinton, who had a 71 percent chance of winning the Electoral College in our final forecast — much lower than most journalists and most other statistical models assumed, as I’m annoyingly obligated to point out — lost the Electoral College on the basis of one thing going wrong: She underperformed her polls among white-working class voters in the Midwest and the Rust Belt. That alone was enough to cost her Michigan, Wisconsin and Pennsylvania and therefore the Electoral College.1 Obama, by contrast, because he tended to overperform in the Midwest and in other key swing states, would have needed multiple things to go wrong to lose to Mitt Romney. Even if Romney had a systematic polling error in his favor, Obama might still have won by holding on to narrow victories in the key Electoral College states. Likewise, Democrats need a couple of things to go wrong to lose tomorrow because not very much is going right for Republicans. (At least not when it comes to the House; it’s all going quite swimmingly for the GOP in the Senate.) At a macro level — based on national indicators and the historical tendency of the president’s party to lose seats at the midterm elections — the situation looks bad for Republicans. But at the local level — when you evaluate factors one district at a time, as our model does — it looks worse. The polling is bad for Republicans, the fundraising numbers are awful, and the slate of potential Democratic pickups runs deep into Republican territory. The data is uncertain, because it contains a margin-of-real-world-error. But I don’t think the data is ambiguous. It says Democrats are over the threshold they’d need to win the House. The range of possible outcomes is wide. The shaded area, which covers the middle 80 percent of the forecast, runs from a Democratic gain of only 20 House seats, fewer than the 23 they need to win the House, all the way up to a gain of 54 seats. And remember — that covers only 80 percent of outcomes. There’s a 10 percent chance that Democrats gain more than 54 House seats and a 10 percent chance they gain fewer than 20. The ranges in the other versions of our forecast, Classic and Lite, are wider still, with the potential for Democratic gains running up to about 60 seats. Nonetheless, the considerable majority of the range is in Democratic territory. The Deluxe forecast shows the Democrats picking up a median gain of 35 seats and a mean of 36. So they do have some margin to spare. Finally, the range is asymmetric, with the left tail (showing Democratic gains of 50+ seats) stretching out further than the right tail (showing a “red wave”). That’s because if Democrats beat their polls by a couple of points, they could begin to plunder seats that were gerrymandered to be “safe” for the GOP. All right: Enough philosophical talk about forecasts and probabilities. For the rest of this update, I just want to talk about the underlying factors behind the election — the micro and macro conditions that are putting Republicans in a tough position. By “macro” and “micro,” I roughly hope to make the following distinction. Macro factors are the hands the parties were dealt, the factors that were in place months or even years ago. Micro factors are how well the parties are playing their hands as they fight to win as many seats as possible. First, the economy is good. Consumers are optimistic, the unemployment rate is very low, inflation is low and wages are increasing. The relationship between economic performance and midterm outcomes isn’t actually that strong. But it gives Republicans and President Trump some kind of positive message with swing voters — if not necessarily a message that Trump has always been disciplined enough to carry out. Second — and this is perhaps the most important factor that I’ll list — Republicans hold a huge intrinsic advantage because they dominated the redistricting process after the 2010 elections in many states. Voter self-sorting further contributes to the Democrats’ problems. Democrats will almost certainly win more votes for Congress on Tuesday — generic ballot polls put them ahead by margins of 8 or 9 percentage points, larger than the margins in the 1994 Republican wave or Obama’s landslide victory over John McCain in 2008. But Democrats would have to win the popular vote by somewhere on the order of 5 to 7 percentage points, according to the various versions of our model, to actually win the majority of House seats. Opposition parties typically do well at the midterms. On average since World War II, the popular vote for the House swings by 7.3 percentage points from the president’s party toward the opposition party in midterm elections. That alone is a pretty big swing and would be enough to make Democrats competitive for the House. In fact, this is one of the most robust regularities in American politics: voters’ tendency to seek balance between Congress and the White House. So as bold as it might seem to suggest that Democrats will win 30-something House seats, that’s actually only slightly above the long-term average in midterms, where “wave” elections are as much the rule as the exception. Next, Trump is unpopular, with an approval rating of around 42 percent (slightly higher in polls of registered and likely voters). A brief approval-rating uptick that Trump experienced late last month appears to have at least partially been reversed, perhaps because of his rhetoric about immigration and reaction to recent hate crimes and domestic terror attacks. Trump is no longer a historical outlier — other presidents have entered the midterms with approval ratings in the low 40s. But midterm losses average about 37 seats for unpopular presidents, almost exactly what we’re forecasting for Democrats. Finally, as parties become more parliamentary and ideological and candidates less-well catered to their districts, the incumbency advantage is considerably smaller than it used to be. This helps mitigate the fact that the map wasn’t drawn to provide for very many swing districts. Note, however, that while this factor helps Democrats in the House, it hurts them in the Senate, where they have a number of vulnerable incumbents. Models based on these macro factors alone might give Democrats somewhere on the order of a 2 in 3 chance of winning the House. Once you take local factors into account, though — and local polling — Republican chances fall considerably. District-by-district polls are quite scary for Republicans, with many Republican incumbents mired in the mid-40s in polls and competitive districts running deep into territory that would have been considered “likely Republican” at the start of the cycle. Moreover, these polls seem to be getting worse for Republicans in the closing days of the campaign. Not only do Republicans need to win a large majority of the toss-up districts, they need to do it while running into a headwind. Democrats have raised a disproportionate amount of money, leading Republicans by somewhere on the order of 2-to-1 among individual contributions in competitive districts. We’ve never seen numbers this lopsided before, and they’ve produced a similar Democratic advantage in television advertising in the closing weeks of the campaign. This may be what’s behind the apparent shift toward Democrats in swing-district polling. Democratic voters are much more enthusiastic than in past midterms, although Republicans are too. This may be more an effect (a consequence of the other factors) than a cause, but nonetheless, “The Resistance” was ready to fight back early, as evidenced by strong Democratic performances in off-year and special elections. Finally, scandalous and/or controversial Republican candidates have added to Republican problems, putting at least three districts in play (Chris Collins’s New York 27, Duncan Hunter’s California 50, Steve King’s Iowa 4) that likely wouldn’t be competitive otherwise. There’s about a 7 percent chance that Democrats win a House majority by three seats or fewer, according to the Deluxe model, so this meaningfully contributes to their chances of a majority. That’s enough. I’m tired of writing about this election, and, like the rest of you, I’m just waiting to see what happens tomorrow. But I hope you see why Republican hopes to keep the House are fairly slim. Democrats have been dealt a good hand and have done a great job of playing it, maximizing their number of opportunities to make seat gains. There’s still a chance — about a 15 percent chance — that their voters won’t turn out in the numbers they need and they’ll fall a few seats short. But it would require polling and a lot of other data to be fairly wrong, and it would defy a lot of historical precedent as to what happens in midterm elections under unpopular presidents. Without one of those states, Clinton wouldn’t have won the presidency even if she’d won Florida.